I am a gadget person. When something new comes out and everybody is talking about it, I have to have it. Just ask my kids about my AppleWatch. Around this time last year, the InstaPot seemed to be everywhere. My friend, Dan, was always talking about what he’d cooked up in his pressure cooker (he’s very inventive with beans and sweet potatoes) and it was all over my Facebook feed (mindreaders that they are). Also, a food writer I really like, Melissa Clark — whose sheet pan dinners are in constant rotation in my oven — had just come out with a cookbook of InstaPot dinners (Dinner in an Instant). Finally, for Mother’s Day, my two older kids got me one, and even though they’d spent their hard-earned money on the appliance, that did not prevent them from rolling their eyes and joking about how I’d never use it. And they were kind of right. I’ve experimented with a few dinners, but nothing really stands out for me to tell you about. And once, I used the InstaPot to make jammy eggs (but using the stovetop is much simpler and you don’t have to haul anything out from a shelf in the closet). But the one thing I make consistently — maybe once a week — in my InstaPot is oatmeal. 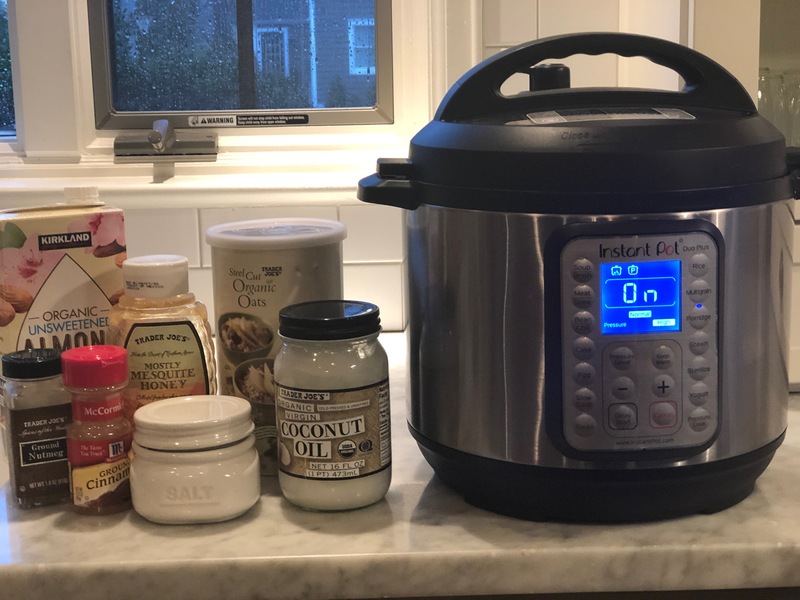 It’s pretty much the same recipe I used to make in my slowcooker overnight, but instead of 8 hours, pressure cooker oatmeal is done in about 30 minutes. It’s gotten to the point where I don’t even use a recipe anymore (and I always need a recipe). I just throw everything into the pot and seal the lid. It makes a bunch so I keep it in a container in my frig to eat for breakfast and force it on my 16yo, which triggers a different kind of eye rolling. I always do blueberries and bananas, since I am a creature of habit. But you could do apples or other kinds of berries. I toast up some unsweetened coconut to sprinkle on top or add a dollop of plain greek yogurt. It’s all very yummy and filling. My friend, Susan, keeps raving about her new air fryer, so guess what I have my eye on for this Mother’s Day? Mush bananas and add rest of ingredients to pot. Set porridge mode for 12 minutes. Enjoy! *To slow cook, mush bananas, add rest of ingredients and set on low for 7 hours. Yummy waking up to the smell of oatmeal waiting for you in your kitchen. Got an InstaPot recipe to recommend? Please do in the comments below! You can also subscribe to my weekly newsletter to see what other things I am in love with at any given time (which is changing all the time, except when it comes to Game of Thrones, to which I am dedicated). This entry was posted in Friday Faves, Recipes. Bookmark the permalink.